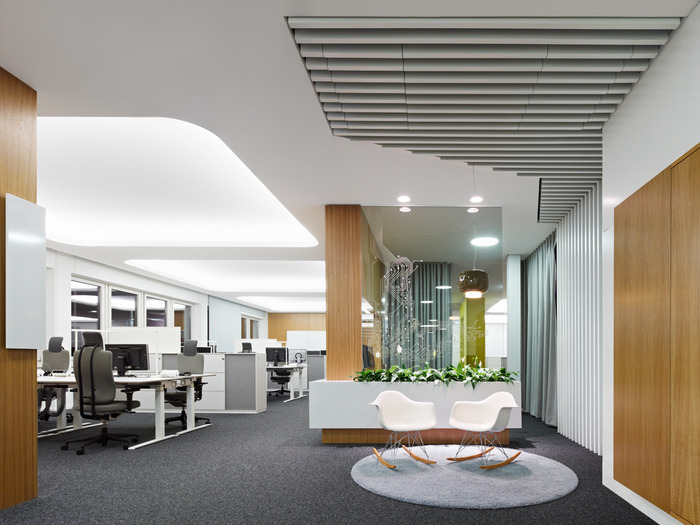 Business software company SAP recently worked with the designers at SCOPE to create an office environment for their Walldorf, Germany Headquarters that wasn’t stuck in the 1990’s. Using teamwork as the basis for the design concept, the new office no longer has an uncommunicative and insulating cell structure, but instead endorses teamwork and supports the specific processes of software development.Teams are arranged throughout the two floors office. And because the floorplan is H-shaped, it allows teams to call semi-private corners of the office home. The office’s design also takes into account the need for programmers to have some amount of privacy to maintain focus. This was completed by creating team workstations areas with adjacent semi-private and private meeting rooms. “The working places present the calmer areas, whereas the communication takes place in think tanks, face-to-face situations and programming stations. The programming stations, where the programmers can jointly discuss solutions, are linked directly to their desktop and allow a quick change of working place. The old, dreary, 90’s style office was livened up bright inspiring space that supports employees in their daily tasks, enriches the creative working process, encourages the communication and also provides the opportunity for concentrated work. “Color and materials emphasize the homelike atmosphere of the concept. The office walls and floor fixtures are kept in a light oak and accented with white painted surfaces. Many painted surfaces are magnetic and writable to support the work of programmers. I find that using a fairly subdued color palette throughout makes the bright pops of color stand out even more, and draws attention to some of the eye-catching design elements of the office. This office also makes it clear that an office doesn’t need to be busy and visually distracting to be inspirational. With team areas at the extremities, the heart of the office is the Marketplace.